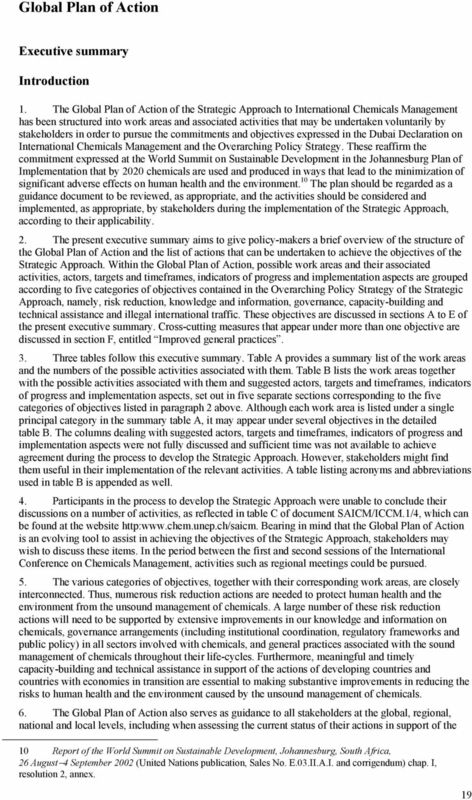 Download "Strategic Approach to International Chemicals Management"
1 Strategic Approach to International Chemicals Management Comprising the Dubai Declaration on International Chemicals Management, the Overarching Policy Strategy and the Global Plan of Action Issued by the secretariat for the Strategic Approach to International Chemicals Management, 6 June 2006, pending formal publication. 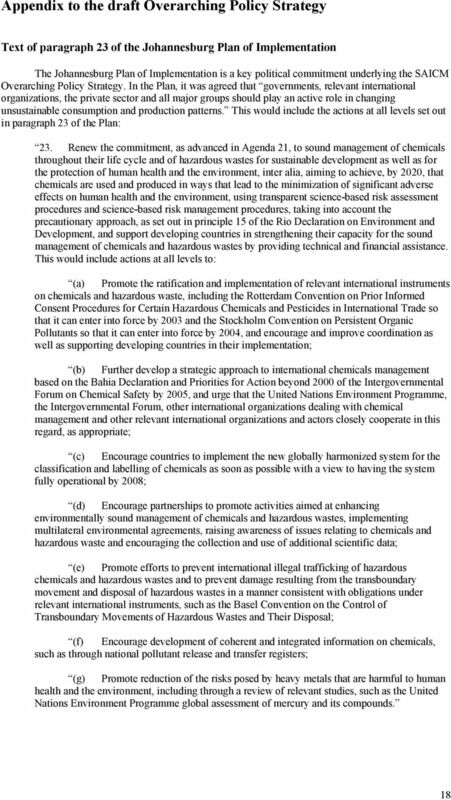 2 At its first session, held in Dubai, United Arab Emirates, from 4 to 6 February 2006, the International Conference on Chemicals Management adopted the Dubai Declaration on International Chemicals Management and the Overarching Policy Strategy. 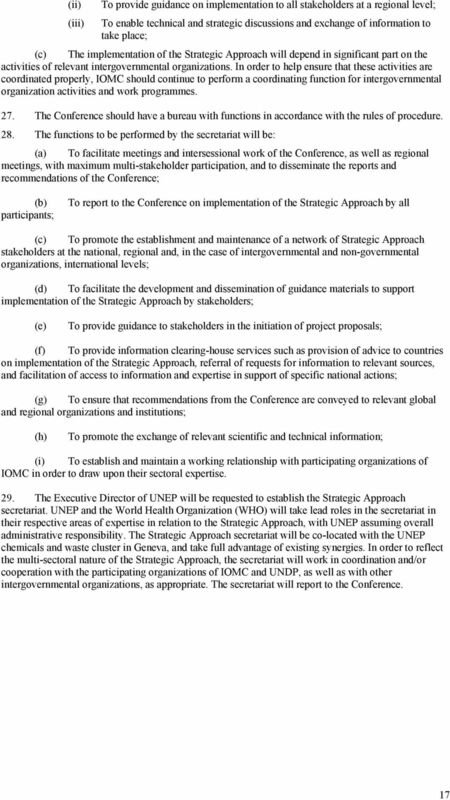 The Conference also recommended the use and further development of the Global Plan of Action as a working tool and guidance document. 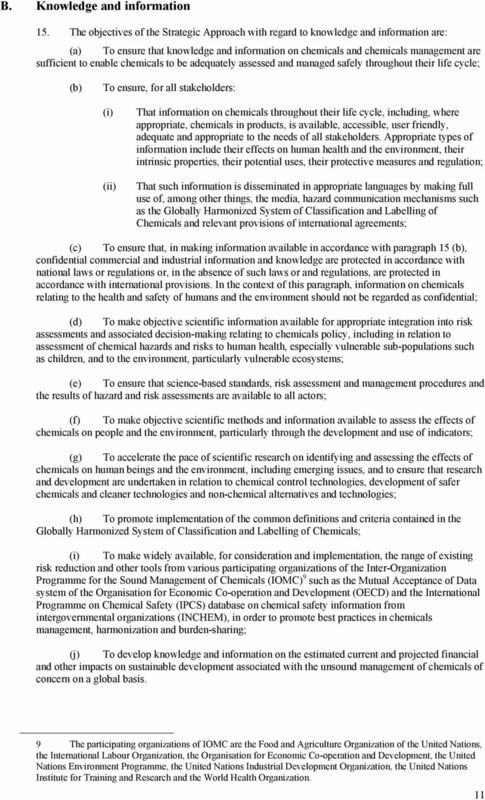 Together these three documents constitute the Strategic Approach to International Chemicals Management. 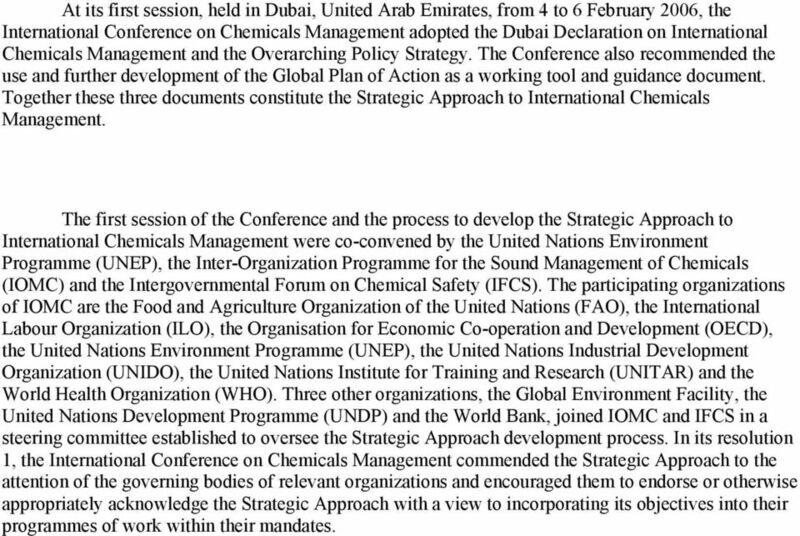 The first session of the Conference and the process to develop the Strategic Approach to International Chemicals Management were co-convened by the United Nations Environment Programme (UNEP), the Inter-Organization Programme for the Sound Management of Chemicals (IOMC) and the Intergovernmental Forum on Chemical Safety (IFCS). The participating organizations of IOMC are the Food and Agriculture Organization of the United Nations (FAO), the International Labour Organization (ILO), the Organisation for Economic Co-operation and Development (OECD), the United Nations Environment Programme (UNEP), the United Nations Industrial Development Organization (UNIDO), the United Nations Institute for and Research (UNITAR) and the World Health Organization (WHO). Three other organizations, the Global Environment Facility, the United Nations Development Programme (UNDP) and the World Bank, joined IOMC and IFCS in a steering committee established to oversee the Strategic Approach development process. 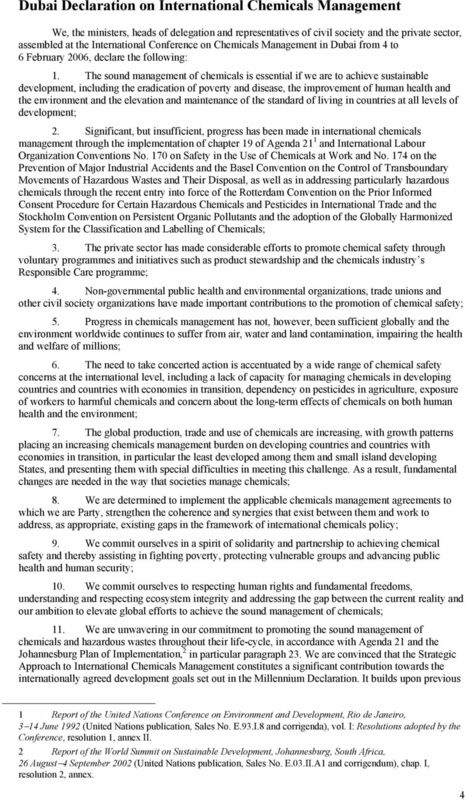 In its resolution 1, the International Conference on Chemicals Management commended the Strategic Approach to the attention of the governing bodies of relevant organizations and encouraged them to endorse or otherwise appropriately acknowledge the Strategic Approach with a view to incorporating its objectives into their programmes of work within their mandates. 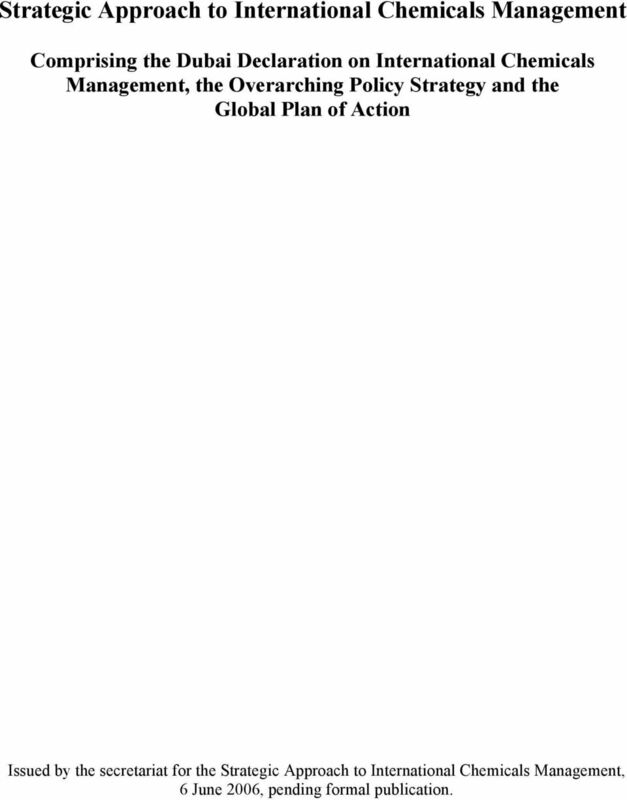 7 Overarching Policy Strategy I. Introduction 1. 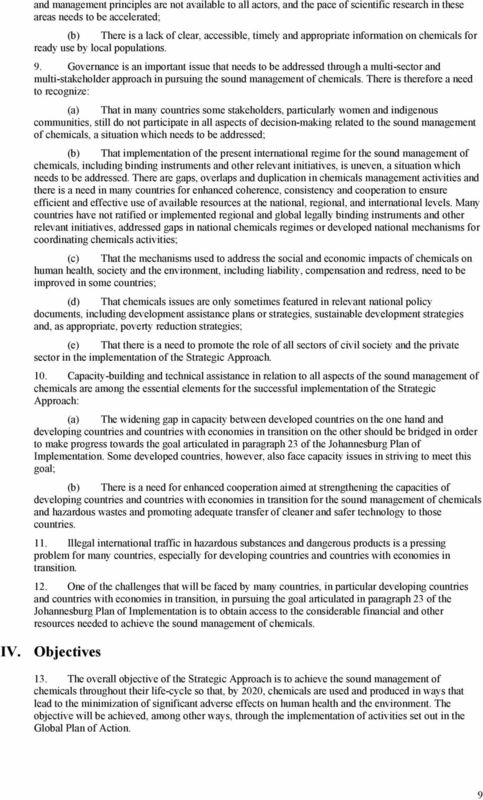 The present Overarching Policy Strategy flows from the commitments expressed in the Dubai Declaration on International Chemicals Management developed in the context of the Rio Declaration, Agenda 21 and the Johannesburg Plan of Implementation. 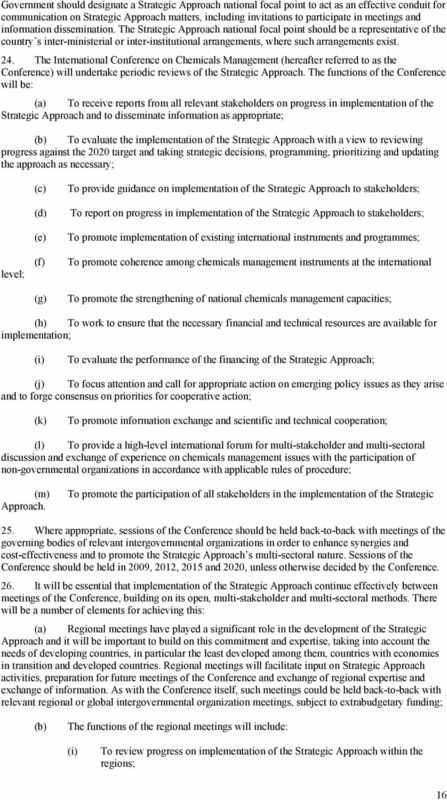 The structure of the strategy is as follows: I. Introduction II. Scope III. Statement of needs IV. Objectives A. 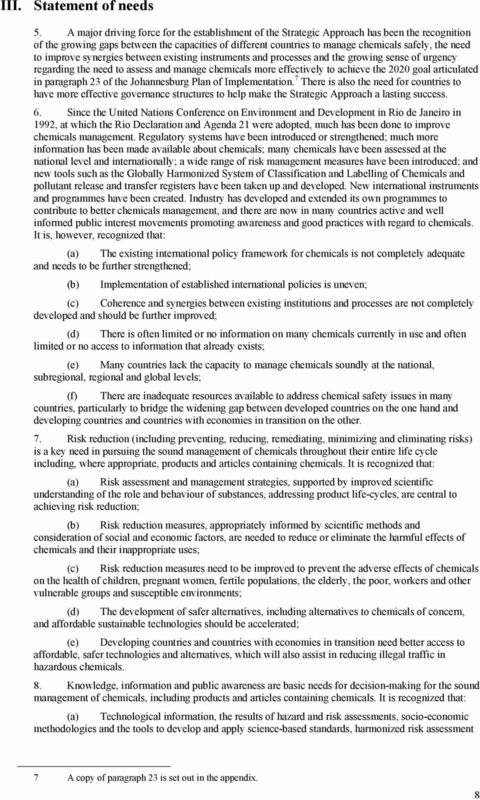 Risk reduction B. 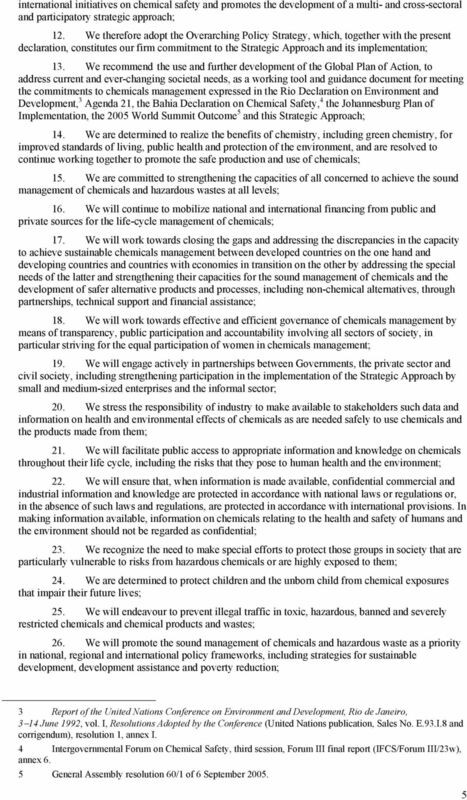 Knowledge and information C. Governance D. Capacity-building and technical cooperation E. Illegal international traffic V. Financial considerations VI. Principles and approaches VII. 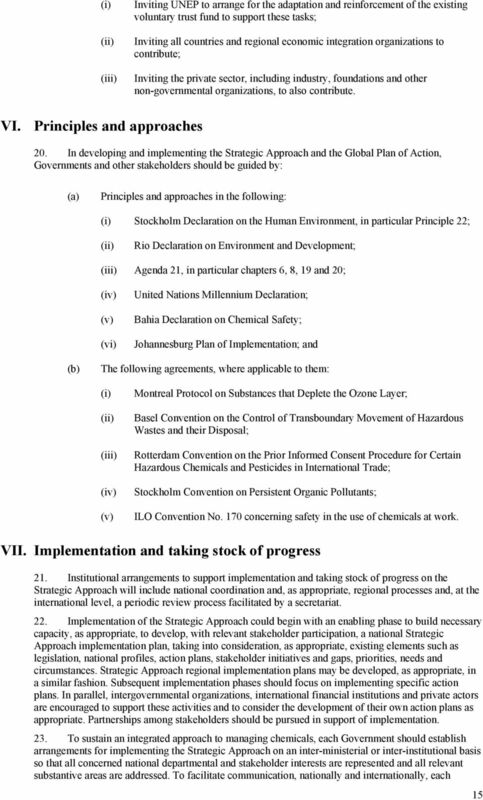 Implementation and taking stock of progress 2. 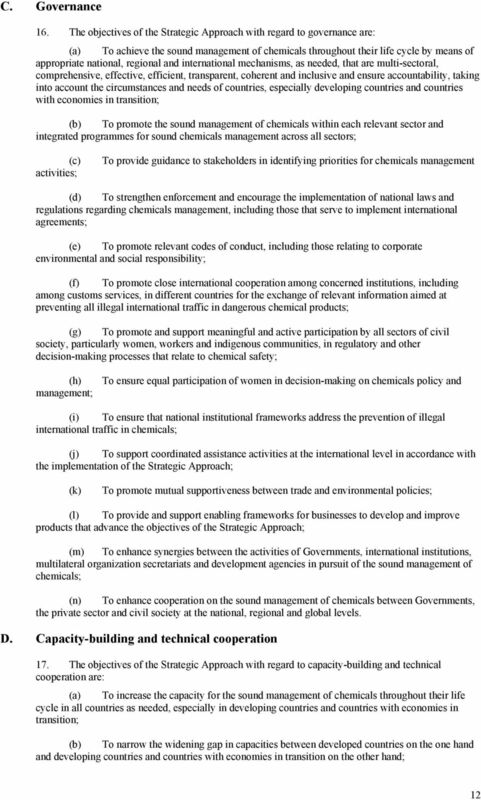 The involvement of all relevant sectors and stakeholders, including at the local, national, regional and global levels, is seen as key to achieving the objectives of the Strategic Approach, as is a transparent and open implementation process and public participation in decision-making, featuring in particular a strengthened role for women. 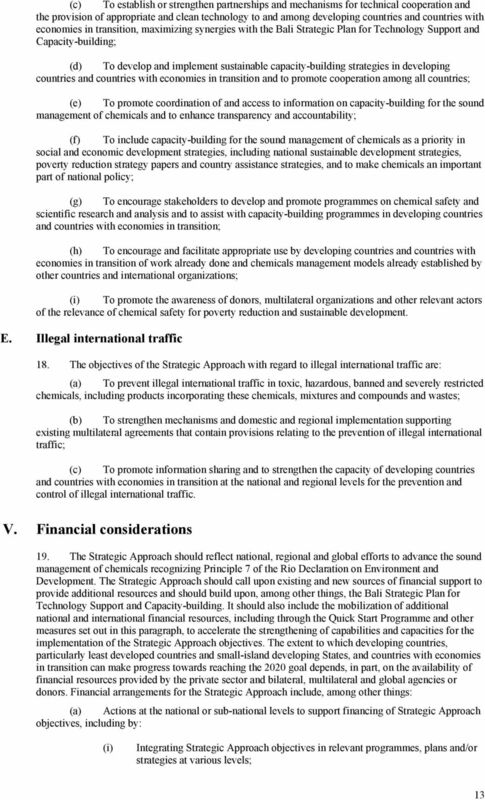 The main stakeholders in the Strategic Approach are understood to be, regional economic integration organizations, intergovernmental organizations, non-governmental organizations and individuals involved in the management of chemicals throughout their life-cycles from all relevant sectors, including, but not limited to, agriculture, environment, health, industry, relevant economic activity, development cooperation, labour and science. Individual stakeholders include consumers, disposers, employers, farmers, producers, regulators, researchers, suppliers, transporters and workers. II. Scope 3. 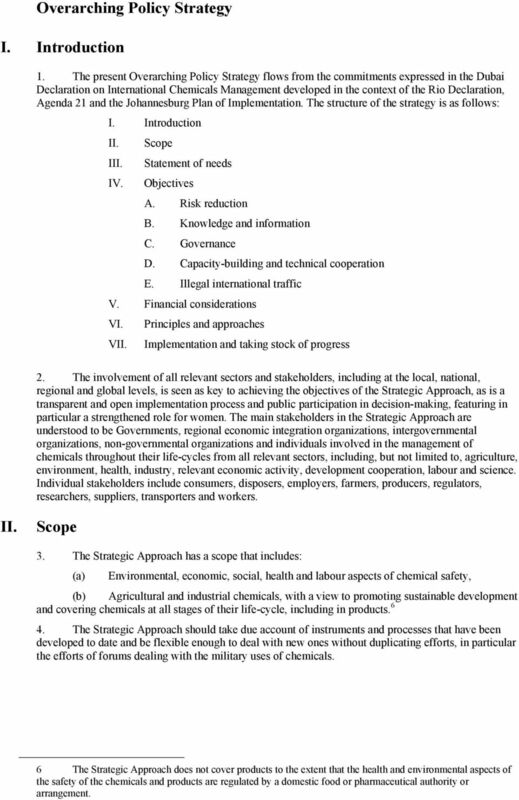 The Strategic Approach has a scope that includes: (a) Environmental, economic, social, health and labour aspects of chemical safety, (b) Agricultural and industrial chemicals, with a view to promoting sustainable development and covering chemicals at all stages of their life-cycle, including in products The Strategic Approach should take due account of instruments and processes that have been developed to date and be flexible enough to deal with new ones without duplicating efforts, in particular the efforts of forums dealing with the military uses of chemicals. 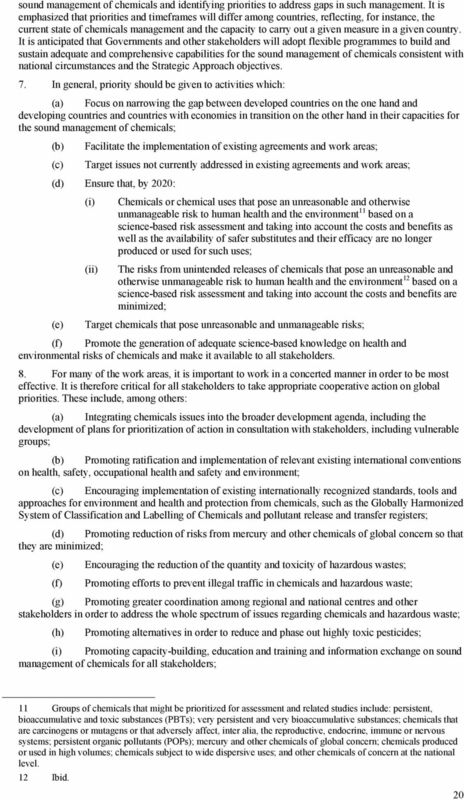 6 The Strategic Approach does not cover products to the extent that the health and environmental aspects of the safety of the chemicals and products are regulated by a domestic food or pharmaceutical authority or arrangement. Nations publication, Sales No. E.96.IV.8), chap. 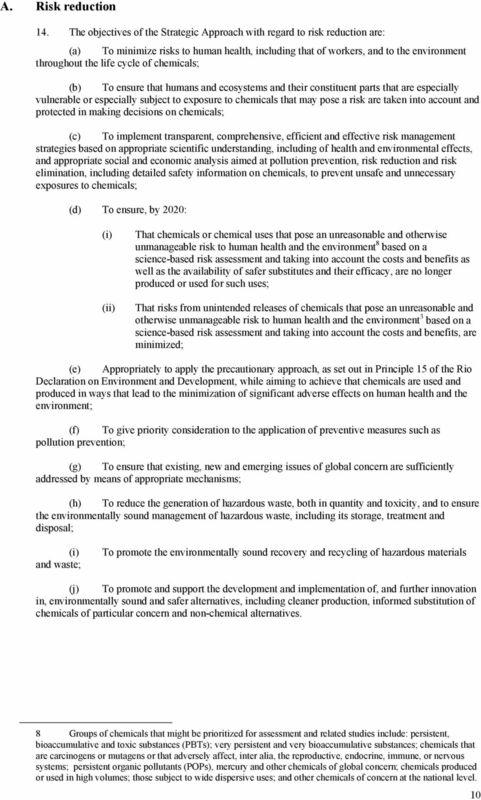 I, resolution 1, annex I. 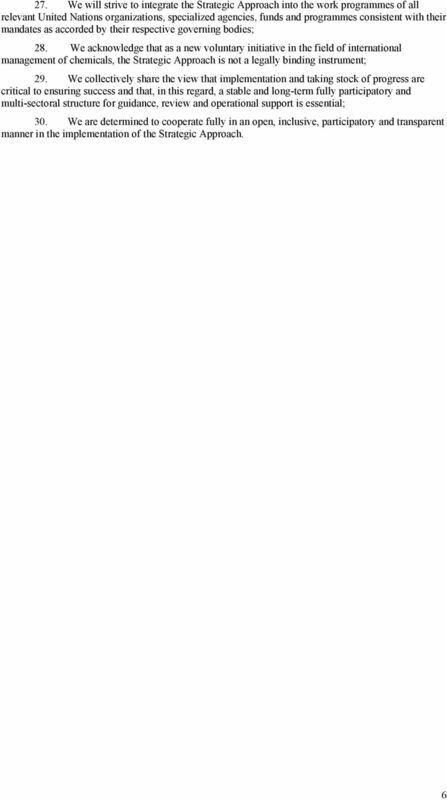 3 Ibid., annex II. 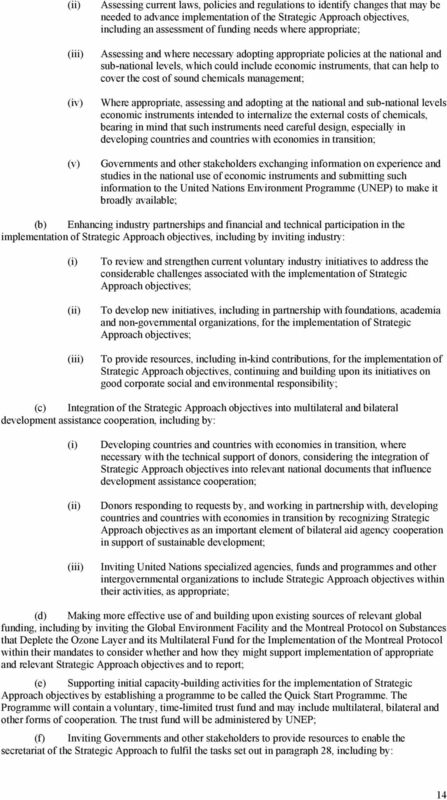 Draft Concept Note Ministry of Foreign Affairs, Republic of Korea. The 2014 Busan Global Partnership Workshop 6-7 November, Seoul. 1.